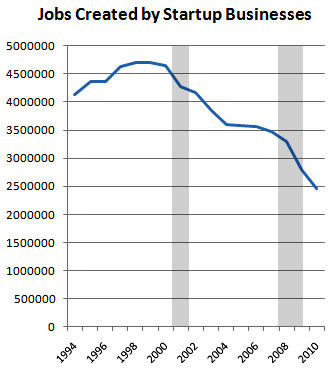 The number of new establishments for the year ending in March 2010 was lower than any other year since the series began….The number of jobs created by establishments less than 1 year old has decreased from 4.1 million in 1994, when this series began, to 2.5 million in 2010. This trend combined with that of fewer new establishments overall indicates that the number of new jobs in each new establishment is declining. ….The number of jobs created from establishment births peaked in the late 1990s and has experienced an overall decline since then. The decrease in birth-related employment during the latest recession is the largest in the history of the series, followed closely by the period of “jobless recovery” after the 2001 recession. Since the recession began in 2008, the biggest net generator of jobs has been neither small businesses nor large businesses. It’s been medium-sized businesses.